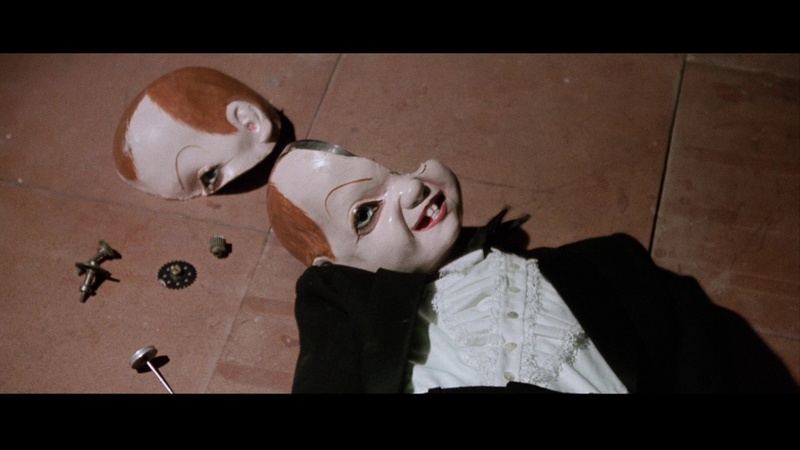 The final word in stylish murder mysteries, Dario Argento's Profondo Rosso (Deep Red) managed to break out of the cinematic horror gutter and became a bona fide classic around the world while revolutionizing what the world now knows as the giallo. Apart from Mario Bava, no one had managed to create such an ingenious combination of visual style, devilish plotting, and a gripping soundtrack; indeed, this is not only perhaps Argento's greatest film, but one of the highlights of Italian cinema as a whole. Deep Red is one of those few, fortunate creations in which every element seems to fall perfectly into place. Argento at the height of his powers is enough of an asset, but the film also has engaging, first-rate performances from Hemmings and Nicolodi, a groundbreaking and often imitated rock score by Goblin with some more traditional contributions by Giorgio Gaslini (buy the soundtrack! ), brilliant mobile camera work by Luigi Kuveiller, and enough shocks to keep the most jaded horror fan on the edge of his seat. 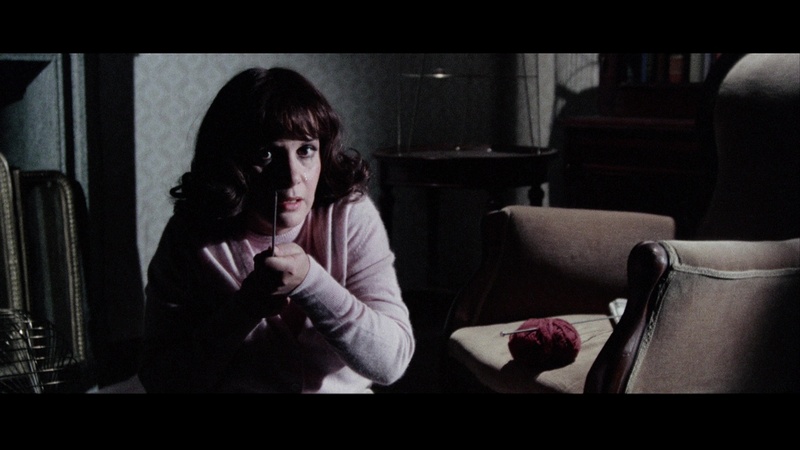 Many of the film's gory set pieces have been copied over the years, with John Carpenter starting the trend with Halloween (the sofa/knitting needle scene) and Halloween II (the scalding bathtub murder). Its influence has been felt for decades now, even leading to a bizarre 2008 stage musical by Goblin member Claudio Simonetti and constant rumors of a remake (sometimes in 3-D), at one time even attached to George Romero. At a parapsychology conference in Rome, German psychic Helga Ullman (Meril) finds her public demonstration disrupted when she senses the presence of a psychotic killer in the audience. "You have killed, and you will kill again," she proclaims, pointing out into the audience. Soon after, she is brutally killed in her apartment, an act witnessed from afar by a British pianist, Marcus Daly (Blow Up's Hemmings). Spunky reporter Gianna Brezzi (Nicolodi) realizes Marc's value as an eyewitness but cannot protect him as the killer continues cutting a bloody path right to Marc's door. Through some amateur detective work, our neurotic hero deduces the killings may be related to an abandoned, supposedly haunted old house on the outskirts of town. 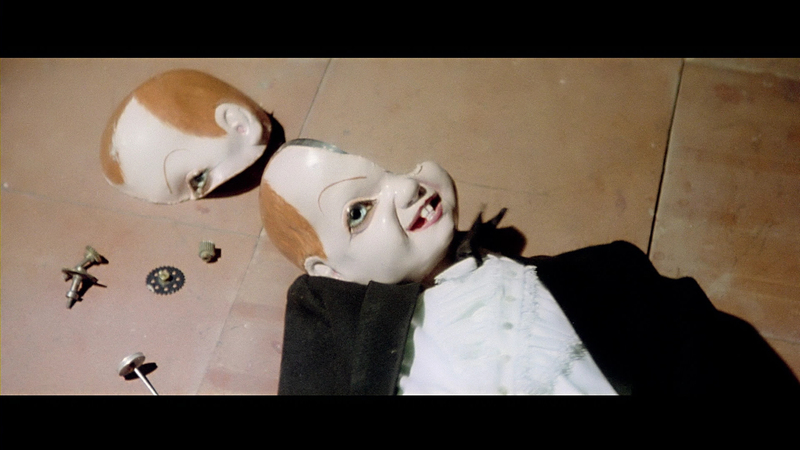 Trying to assemble a "complete" official version of Deep Red has been a daunting task over the years. Most English-speaking viewers first saw a drastically cut 98 minute version, sometimes under the title The Hatchet Murders. This edition turned up horribly panned and scanned on VHS from HBO, but soon after a letterboxed Japanese laserdisc turned up under the title Suspiria 2 (though this film was made first!). This export cut usually regarded as the complete international English version, running 105 minutes, contained several extra gory shots and a comic relief sequence with Hemmings and Nicolodi riding in the latter's junky car. Italian VHS fans who ponied up money for their Domovideo release found an uncut, two hour version without subtitles; this edition contains no extra gore or plot information, but a great deal of extra local color and comic/romantic interplay as well as the evocative original intermission break. Anchor Bay's DVD from 2000 assembled all of the extant English language footage (and yes, the film does work much better in English given the excellence of Hemmings' vocal performance) with the extra Italian scenes for the closest thing to a complete Deep Red we will probably ever see. This was also the clearest version at the time; a major clue early on in the film is also much easier to see, as is the revelation concerning that creepy fresco. 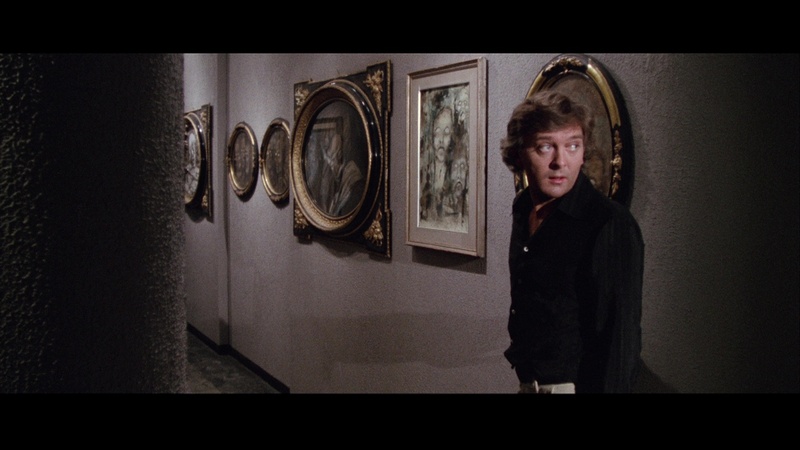 While the film's closing credits were prepared both in Italian and English ("You have been watching Deep Red! 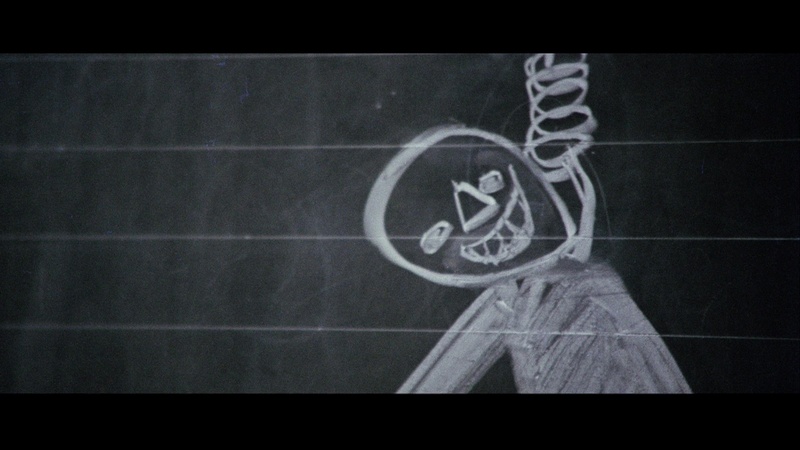 "), the DVD controversially included a newly created variant with the English credits rolling over a still shot of Hemmings' face. It's a bizarre alteration that immediately irritated purists and remained a sticking point for years. As for audio, the mono soundtrack was been remixed to 5.1, with decent results. The music carries most of the load for the exterior sequences, with only a few sound effects making their way to the rear channels. A few sequences which would seem to call out for the 5.1 treatment, such as the gruesome garbage truck scene, remain almost entirely dead center. The Italian dialogue is presented with subtitles during the additional scenes for the English soundtrack, while the Italian-only version may be played with subtitles throughout. The disc includes two theatrical trailers: one for the U.S. (a longer version of the one included on Mad Ron's Prevues from Hell) and the original Italian (which includes some intriguing still photos). Argento appears for an intriguing interview segment in which he's joined by Goblin band members and co-writer Bernardo Zapponi. However, the biggest drawback to the Anchor Bay version is the liner notes, among the most inept ever published. The subsequent reissue from Blue Underground ports over the exact same transfer and contents but thankfully without the insert. Various other versions appeared on DVD in Europe throughout the years including a slightly trimmed UK edition (which drops the lizard on a pin shot due to UK video regulations), an Australian release culled from the same transfers, and a Spanish release of the 105-minute cut inexplicably cropped to 1.78:1. Fans of the shorter cut (including this writer, who feels it's a better way to experience the film for first-time viewers who can then move to the Italian version once their feet are wet) first got their prayers answered with AWE's very welcome two-disc release, which ditches the US featurette but is in every other way an improvement. Disc one contains the long Italian cut with English, Dutch, and Finnish subtitles, with audio in 5.1 or 2.0 stereo. 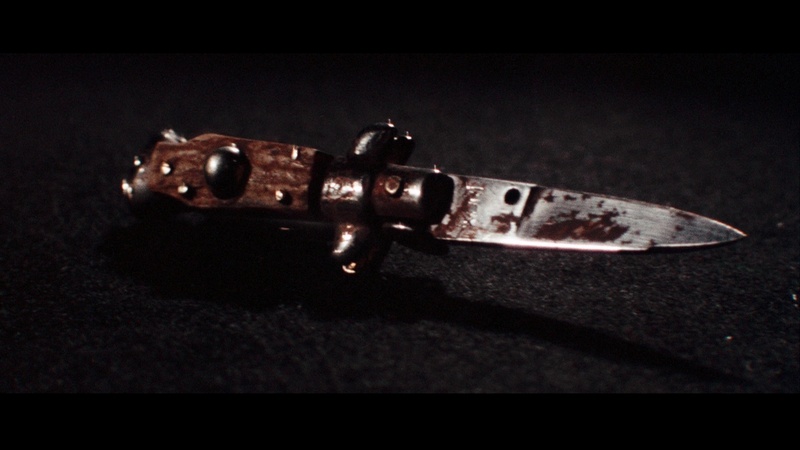 Viewers watching it in progressive mode will notice some jerky motion problems from time to time (unfortunately most obvious during those great close-up gliding shots through the killer's dolls and other artifacts) due to the original master being created in NTSC. The first disc also contains the same two trailers as well as a great new bonus, a full commentary track by the disc's producer, Thomas Rostock, who provides one of the most engaging breakdowns of an Argento film ever created. He's extremely knowledgeable about the film and rattles off both reams of amazing trivia and eye-opening insights into the themes, structure and symbolism of the film; you'll never watch it the same way again. Interestingly, he delves into some of the Hebrew imagery present in the first half and the continental tensions running throughout the story; for an interesting companion piece, check out the thematically similar Phenomena, which takes place during Passover and has some truly grotesque religious undercurrents. 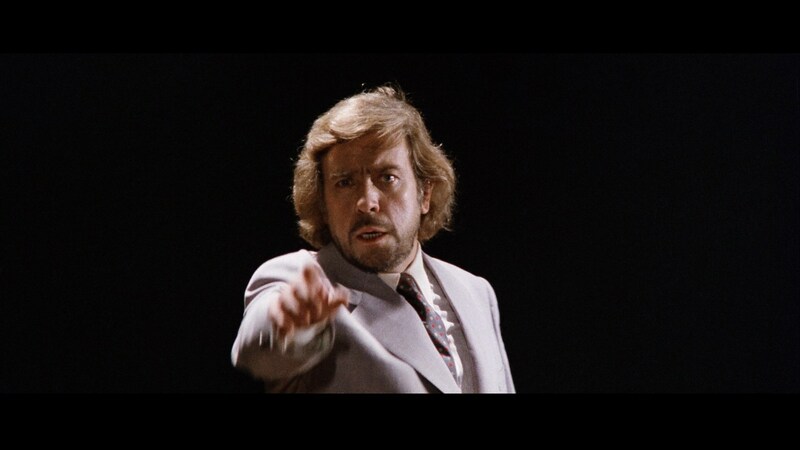 Disco two contains the 105-minute cut for the first time in full scope; the bulk of it appears to be of the same transfer quality as the Italian cut (from which it was most likely created), but the closing titles are obviously taken from a different and slightly more worn print. The second disc is rounded out with the Dario Argento: An Eye for Horror UK TV special, which everyone probably has already. You also get new trivia-packed bios for Argento, Hemmings and Nicolodi, a still gallery, and a liner notes booklet in Danish. In perhaps one of the strangest developments in this title's already bizarre video history, the Blu-ray era brought in two releases almost simultaneously in the UK and US in 2011. First out of the gate is the British Arrow release, a two-disc set that contains the complete Italian cut on the first disc and the 105-minute, all-English cut on disc two. This version was culled from an Italian HD master originally premiered as a digital release and looks better than any of the DVD versions, though flesh tones in some scenes have an odd yellow cast that makes some of the actors look a little jaundiced. Some obvious grain removal in a few key scenes also softens the image more than necessary, particularly in close-up shots. (There's also an odd, distracting, and major digital glitch at the 45:30 mark over Gabriele Lavia's face.) For the English version, the opening and closing titles in English have obviously been spliced in from a much lower quality standard def source. It's not bad and definitely beats any standard def option by a long shot (especially for the price), but the room for improvement is obvious. The 5.1 remix is also effective but occasionally problematic, including some awkward shifts to multi-channel music tracks that sound like they were abruptly looped in from a CD (especially the doll-and-eyeliner montage with the main theme playing after the close-up of the bathroom sink). The language options on the Italian track are essentially the same as the American DVDs, either all Italian with optional subtitles or that jarring mixture of English and subtitled Italian which often jumps back and forth within the same scene. What will make this one a must for Argento fans is the raft of extras including a video intro by Simonetti, the terrific Rostock commentary from the AWE disc, the Italian and English trailers, a new 21-minute video interview with Nicolodi called "The Lady in Red" (shot back-to-back with her interview for Arrow's Inferno) in which she talks about meeting Argento and doing her first project with him, an English-language 16-minute interview with Simonetti ("Music to Murder For!") 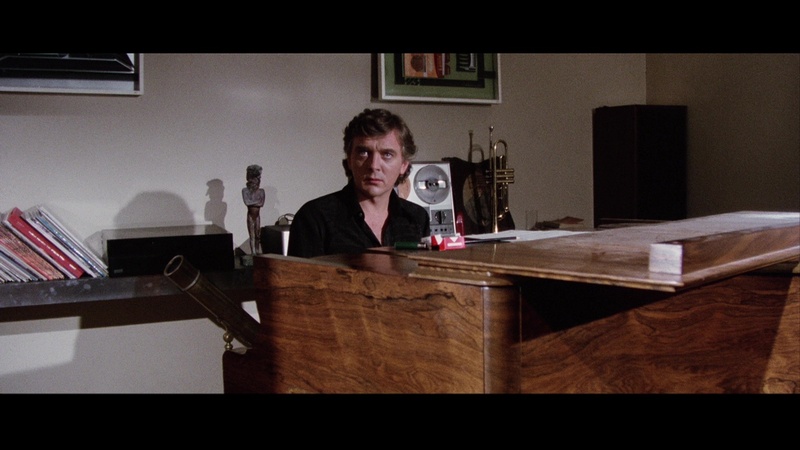 about the formation of Goblin and how they were brought on to adapt with Gaslini's score, and a 14-minute interview with Argento ("Rosso Recollections") about the genesis of his early thrillers and the process that led to Deep Red including some oblique nods to Agatha Christie. 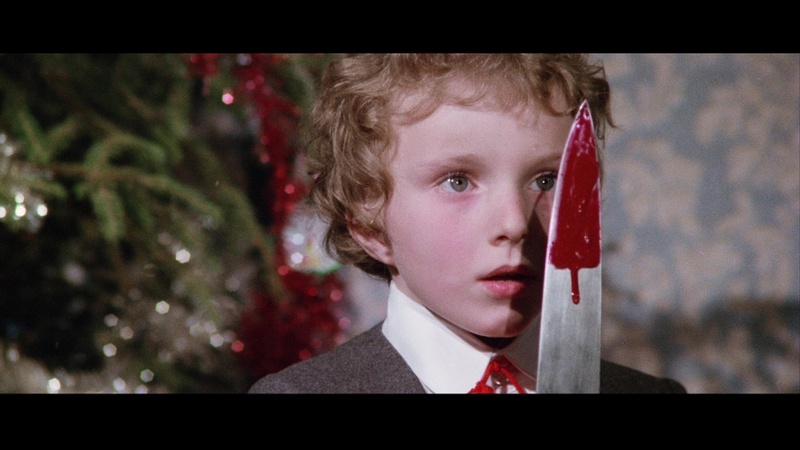 The second disc also adds a fun 15-minute look at the Argento-founded Profondo Rosso shop in Rome run by Luigi Cozzi ("Rosso from Celluloid to Shop"), while the typically lavish packaging includes reversible artwork with four cover options, a fold-out poster, and a booklet with solid liner notes by Alan Jones. 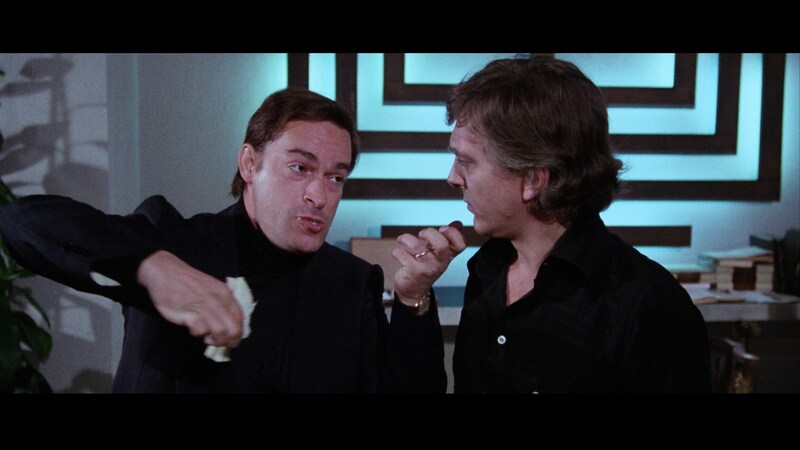 Though it doesn't even try to compete in the extras department, Blue Underground's Deep Red Blu-ray is an improvement on the video front and still the best option for Region A buyers. This is definitely a case where frame grabs can't possibly tell the whole story, as both this and that Arrow disc are obviously taken from the same Italian HD master; click any of the frame grabs at the bottom of this review for a comparison. The difference is obvious when you watch both in motion, as the Blue Underground has a fine, cinematic grain structure with much deeper, more satisfying detail in movement and especially in dark scenes. 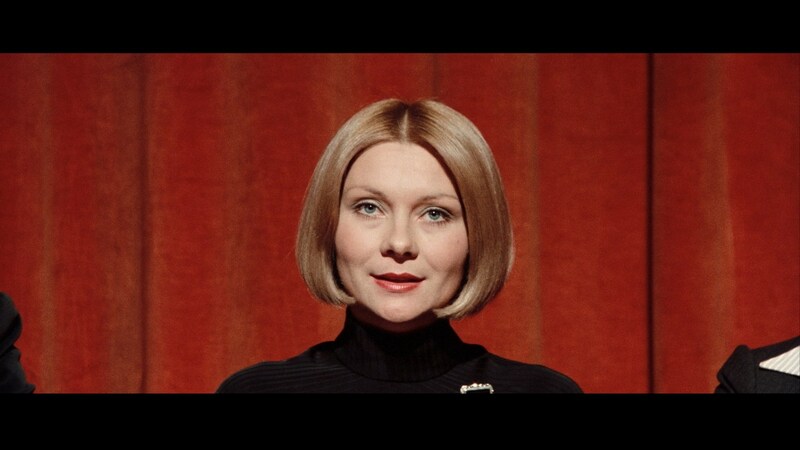 By comparison, the Arrow often betrays a combination of softened edges and even fuzziness due to noise reduction (note the edges of Helga's hair during the psychic seminar at the beginning against the red curtain) and some odd digital coarseness in the image, while the Blue Underground looks more like a natural, fine film element. The color temperatures also vary in several scenes, most noticeably near the end; compare the shots in the last frame grab, which feature very different flesh tones. The full Italian version is presented with audio options including the Italian track (7.1 DTS-HD, 5.1 Dolby Digital Surround EX, or mono) with optional English subtitles, or the Italian/English hybrid again (5.1 Dolby Digital Surround EX); subtitle options in addition to English include French and Spanish. The same subtitle options (though English is SDH this time) are included for the 105-minute cut, making its American home video debut. The transfer itself is equal to the Italian one but also sports much better-looking opening and closing English credits. For the record, the end titles on both versions are the original theatrical ones with Hemmings continuing to move; no digital monkeying around this time, folks. Extras are ported over from the Blue Underground DVD including the Argento/Goblin/Zapponi featurette, the Italian and English trailers, and the Daemonia music video by Sergio Stivaletti. Special mention should also go to the striking menus, which make clever use of the Italian Vertigo-inspired poster art. 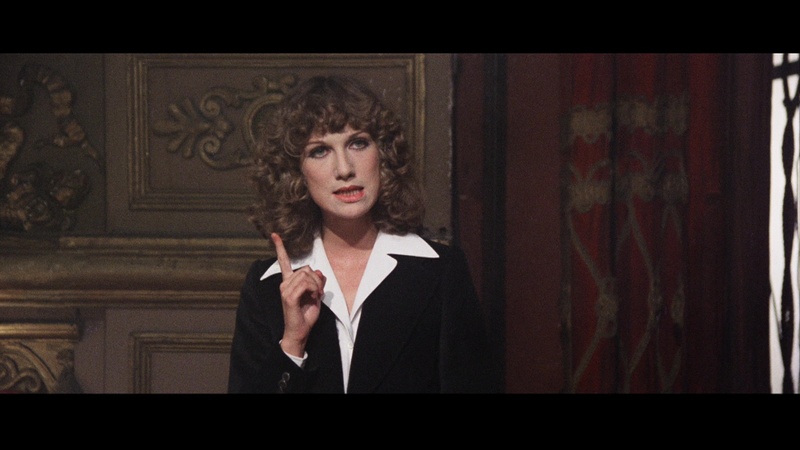 Also on the first disc are the lion's share of the earlier Arrow extras: the excellent Rostock commentary, "Rosso Recollections," "The Lady in Red," "Music to Murder For!," the Simonetti intro, and the Profondo Rosso shop visit, plus an improved transfer of that wild Italian trailer. The main feature itself looks gorgeous with much more accurate flesh tones, far finer detail and more natural film grain, and beautiful deep blacks throughout that really cause the film to look more textured and dimensional than before. (That transfer is the source of all the frame grabs seen throughout the body of this review.) There's also a significant amount of additional image information visible on the left and bottom of the frame, which actually helps out the compositions in several shots. Due to a new opening text intro explaining the restoration process, the running time is now slightly longer thank usual and clocks in at 127 minutes and 14 seconds. Exclusive to this set is a second disc containing the 105-minute theatrical cut, sourced from the same greatly improved restored source with English LPCM mono audio with optional English subtitles. The familiar U.S. trailer is also included as an extra in HD, and the third disc is a 28-track CD soundtrack containing the full Goblin and Gaslini score (albeit without the extra demos found on the double-disc Cinevox set linked above). The generous packaging includes six postcard-sized lobby card reproductions, a double-sided fold-out poster, the usual reversible sleeve art options, and a liner notes booklet with a new essay by Mikel J. Koven (La Dolce Morte: Vernacular Cinema and the Italian Giallo Film) and the older essay by Alan Jones. The same essential package was issued belatedly in the U.S. in 2018, featuring both Blu-rays but minus the soundtrack CD.